Of the tefillos in the siddur that you say on a daily basis, is there one that you have an easier time relating to over others? If so, why? There used to be a time when I could always count on a few phrases that "spoke" to me to carry me though an otherwise uninspiring and dry prayer ritual. At one time at was the majestic vision of all of humanity bending its knees before the Almighty. Later in life, personal closeness to Hashem became important and the verses that express longing for such closeness became my special favourites. There was a time that getting a spiritual boost from these phrases made me feel proud and accomplished. No more! I have gradually realized that the daily prayers are a voyage, an experiential journey, a clearly defined progression with a beginning, an end, and many waystations in between. Perhaps it is a process of walking from the outside of the Temple Mount to the awesome entry into the Holy of Holies as Rav Schwab portrayed it in "Rav Schwab on Prayer". Maybe it is a process of building a mishkan as the Alter Rebbe represents it in Likkuttei Torah, Pekudei 8. Perhaps it is some kind of rising thorugh the combinations of pirtsufim and kavvonos, as per Ari in shaar Hakvonos. 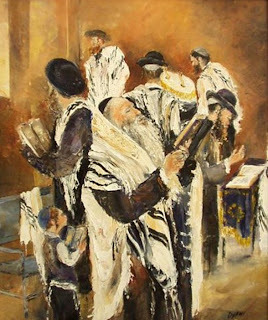 However one visualizes the order of prayer, it is a dynamic, a progression through different inner experiences that change and interweave emotional states that ride upon the words, that intertwine with the sound, niggun, feel, motion and meaning of what is being said and pronounced, that at its best is seamless and organic, involving all levels of Nefesh, Ruach, and Neshoma, body and soul in the intense and powerfully overwhelming experience of dveykus. For this journey, one must prepare and must pine. It does not happen often, but when it does, it "rocks". Kabbalistic and Chassidic sources insist that prayers must be said in the order in which they are printed because the prayer experience builds upon itself, progresses through stages, building up step by step. It follows then that there was nothing for me to be proud of in an prayer in which a few isolated verses give a temporary lift - out of context. Nevertheless, we must be practical. A perfect prayer experience is rare and difficult to achieve. There are times of warmth and times of coldness, expanded consciousness and constricted consciousness, closeness and distancing, optimism and despair. The word for spirit is the same as for wind. A spiritual seeker never stays in one place. It is only in transitioning and transformation that spirituality can be felt. To make the journey, everything must be just right - the surroundings, the inner state, the preparation of the body and the mind. It is more common to fall into the prayer groove at some later time in the course of davening, or sometimes not at all. At such times of distance and coldness, the uplift of favourite phrases maintains the memory of the connection that awakens the longing for the complete experience of prayer - when one transcends himself and his surroundings and is absorbed temporarily into the Great Light. Nevertheless, we must be practical. A perfect prayer experience is rare and difficult to achieve. There are times of warmth and times of coldness, expanded consciousness and constricted consciousness, closeness and distancing, optimism and despair. The word for spirit is the same as for wind. A spiritual seeker never stays in one place. It is only in transitioning and transformation that spirituality can be felt. To make the journey, everything must be just right - the surroundings, the inner state, the preparation of the body and the mind. Shortly after I made Aliyah, in the fall of 2000 (5760) I was praying minha very hastily and without a minyan. I pondered why it was that sometimes I was able to pray with great kavanah sometimes, and other times it felt like i was an empty automaton. At some point I realized, "Wait a minute! my prayers aren't lacking because HaShem has no interest in connecting with me. He is unchanging and always there waiting for us to call out, he has literally infinite patience. It must be that i'm not connecting because I don't care enough to invest the energy to do so." And so I stopped rushing through minha and slowed down and slowed down and slowed down, determined no matter what to connect. Thank you. I have benefited much from this post. I think you're right. The main thing is to pay attention. Speaking only for myself, iff I am in a rush, then my tefillah is an empty exercise, I excuse myself by saying that this time is just for practice, just to memorize another section, or something like that. The experience is much different if I concentrate, take my time, and try to mean what I say. On the other hand, a tefillah is a tefillah, and I agree that Hashem will rejoice with us to the extent that we can rejoice, so nothing is wasted. I think the sort of attitude expressed in stories about the Berditchever is right. Let me add that I think your post was fully in the spirit of the Berditchever, and I agree that in any tefillah of any yid in any frame of mind, there is indeed a pintele something that the Seraphim and Khurovim admire and even envy. This writer is amazing and wise, it is so beautiful. He describes something so true that I have never been able to put into words.